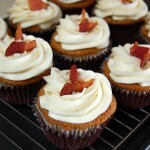 Sweet maple and savory bacon cupcakes! Cook 8 strips of bacon in a fry pan, until crisp. Reserve the drippings and place in the refrigerator to solidify. Mince 1/4 cup of the bacon, set aside. Save remaining bacon for garnish. Preheat oven to 350 degrees. Line 12 standard muffin tins with paper liners. 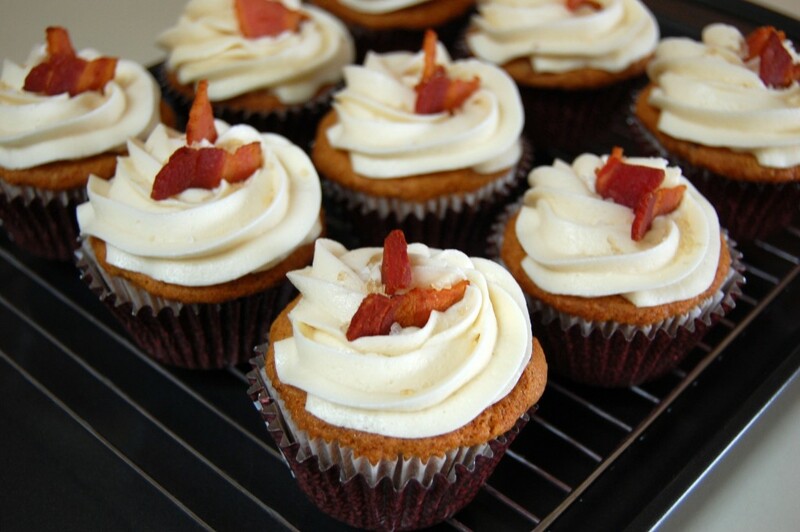 CUPCAKES: In a large bowl, beat butter and solidified bacon fat, until light and creamy. Add brown sugar and maple syrup, beat until well combined. Add egg, beat until well incorporated. In a separate bowl, sift the flour, baking soda, baking powder and salt together. Add half of the flour to the wet ingredients, then half of the milk, continue to alternate the dry and wet ingredients. Mix until just combined. Fold in 1/4 cup minced bacon. Divide batter evenly among lined cups, filling each 2/3 full. Bake for 18-22 minutes or until a toothpick inserted comes out clean. Be sure to rotate the pan after the first 10 minutes for even baking. Cool on wire racks. MAPLE SYRUP FROSTING: Beat butter and syrup together until combined. Add confectioners' sugar a 1/4 cup at a time, beat at high speed, until smooth and creamy. Pipe or spread onto cupcakes. Sprinkle cupcakes with sea salt and turbinado sugar if desired. Top with reserved crumbled bacon.